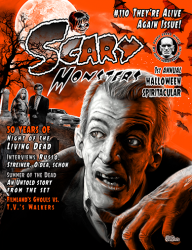 Scary Monsters' #110 They're Alive Again Issue is our First Annual Halloween Spiritacular! Huge 176 pages. For the first time it's Augmented Reality-capable when reader uses a free app for their smartphone to bring art and some images alive! See our Scare-Blog! above for instructions. SPECIAL SURPRISE MAKES THE PAGES OF 110 COME ALIVE:. For the first time it's Augmented Reality-capable when reader uses a free app for their smartphone to bring art and some images alive! See our Scare-Blog! above for instructions. We honor the 50th anniversary of George Romero's groundbreaking (literally) Night of the Living Dead with four interviews by Dr. Gangrene and fan reflections of being on set. Also, we touch on the world of Halloween masks and costumes. And, a horror wimp confesses, a hypnotist reveals hypnotism in horror films, and director Frank LaLoggia speaks on his haunting film Lady in White. Plus, Kaiju Korner, Strange Days, Weird USA, and much more! Now, enjoy Dr. Gangrene's special preview of Scary Monsters #110!